Dialogs provide an efficient way for the application to communicate with the user, but complex dialogs suffer from the problem that they often take up too much screen area. By using a number of tabs in a dialog, information can be split into different categories, while remaining accessible. 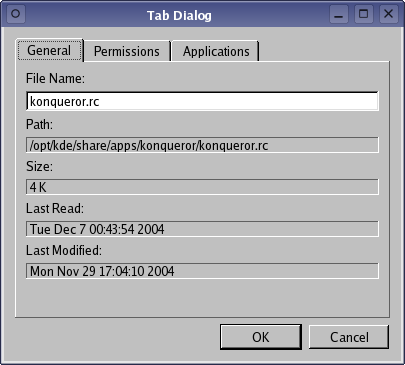 The Tab Dialog example consists of a single TabDialog class that provides three tabs, each containing information about a particular file, and two standard push buttons that are used to accept or reject the contents of the dialog. In the example, the widget will be used as a top-level window, but we define the constructor so that it can take a parent widget. This allows the dialog to be centered on top of an application's main window. The constructor calls the QDialog constructor and creates a QFileInfo object for the specified filename. The tab widget is populated with three custom widgets that each contain information about the file. We construct each of these without a parent widget because the tab widget will reparent them as they are added to it. Each of the tabs are subclassed from QWidget, and only provide constructors. alwaysCheckBox = new QCheckBox(tr("Always use this application to "